At HOLDFAST, we carry many of the accessories to make your job run smoothly. Unlike other ICF companies who require you to spend costly time and energy looking other places for accessory items, HOLDFAST makes it easy to get everything in one place. DELTA®-MS is a highly effective foundation waterproofing system, based on a uniquely formed air-gap membrane. . 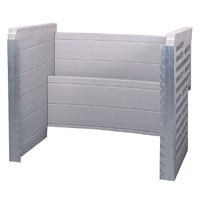 This unique design allows any water getting past the dimpled membrane to fall freely to the footer drain. The air-gap, which is created by the impermeable dimpled sheet, guarantees a safe separation between the foundation wall and any ground-moisture. Thus the membrane keeps water from ever touching the wall on its way through the soil to the footing drainage system. If water were to cross the sheet anywhere, the air-gap would allow it to drain without building up any hydrostatic pressure. The air-gap also allows the foundation wall to "breathe". During back-fill operations the tough membrane serves as a protection layer. 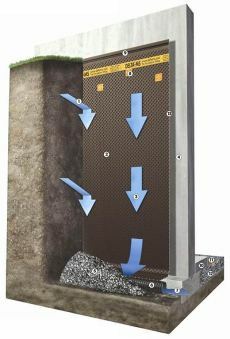 FORM-A-DRAIN™ is the patented 3-in-1 foundation solution that forms footings, provides an integrated drainage system, and can be easily adapted to vent radon where needed. 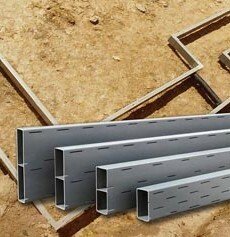 Unlike standard wood forms, Form-A-Drain lineals stay in place permanently after completion of the concrete pour, enabling them to function as a foundation drainage system and — because they form a complete sub-slab perimeter loop around the foundation — a key element of a radon reduction system. And because it stays in place, Form-A-Drain shaves valuable time from the construction schedule.. The Bilco Company has built a reputation among architects, engineers, and the construction trades for dependability and for products that are unequaled in design and workmanship. 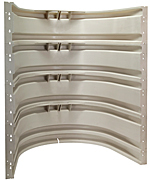 Holdfast Technologies, LLC inventories numerous egress products by Bilco, including Stack-well, Scapewell, and Ultra-Series Basement doors. 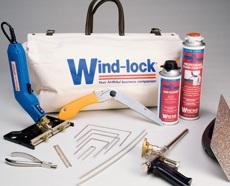 For over 20 years, Wind-lock has supplied the ICF market with the tools and accessories to get the job done right, on time, and on-budget. Holdfast inventories many Wind-Lock products used in ICF Construction. Holdfast primarily stocks Simpson's ICFVL Ledger system, but has full access to all of Simpson's product lines.